TBC typically YZ powder is meant to be porous after spray. But given a porosity limits to meet, it should not over the limit with all the recommended parameter..and to be frank I have not encountered any problem spraying this powder using a normal 7 ot 9MB gun. But I have an outlier incident that porosity of the sample exceeded the limits..microstructure of the coating has very big porosity which is abnormal..
1. What would be the main causes towards porosity over max condition? 2. What is the parameter that contribute to this? Theoritically Increasing of 1st gas or decreasing of 2nd Gas, Increasing of current? and Partice size and increasing of spray distance will contribute to it.. but what is the mechanism of porosity formed during the srraying? 3. If all my parameter is established and constant, what can a defective equipment contribute to this ? 4. What could a sprayer defective practices that contribute to this ? Quote: 1. What would be the main causes towards porosity over max condition? If this is your problem you should be able to recognize it by the lay of the splats, they start to align themselves roughly perpendicular to the line of spray . Some powders contain hollow spherical particles which naturally tends to increase porosity and helps with deposit efficiency. This should not really be a factor here unless the powder has been changed. Shrinkage of particles on cooling naturally contribute towards porosity and cracking. Again this should not be significant factor here. Quote: 2. What is the parameter that contribute to this? Theoretically Increasing of 1st gas or decreasing of 2nd Gas, Increasing of current? 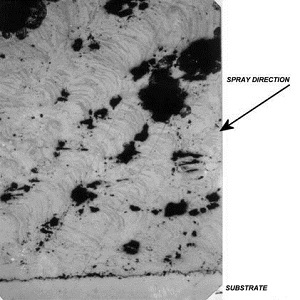 and particle size and increasing of spray distance will contribute to it.. but what is the mechanism of porosity formed during the spraying? Quote: 3. If all my parameter is established and constant, what can a defective equipment contribute to this ? Well this could almost be anything. Just make sure equipment is serviced and calibrated. Regularly check for leaks particularly powder feeder. Check hardware condition like nozzle/electrode, powder port (also alignment) and hoses. Check powder condition. Quote: 4. What could a sprayer defective practices that contribute to this ? This unfortunately is probably your highest risk area. Apart from not setting correct parameters say like spray distance or using the wrong nozzle etc. etc... an unobservant operator can miss things like pulsating powder feeding, pressure drops in gas supplies, fouled powder ports, gun moving from mounted position etc... Really any change from the ideal set-up is capable of effecting coating quality overall not just porosity. Finding the cause to your problem will probably be very difficult. Look at your microstructures again to see if they hold any other clues, like splat angle as in the case of iincorrect spray angle as discuss above. Are unmelted particles higher or lower than usual? Is porosity evenly distributed through out coating? Is porosity large or small? etc.. Finally I must mention metallographic preparation. I doubt this is a problem in your case, but I have come across it so many times. Company sprays TBC just like yours, gets outside metlab to evaluate coating metallography. Metlab reports 30-50% porosity (should be 5-15%). Company revises spraying parameters. Metlab reports no improvement. I regrind and polish same mounted specimens and report less than 5% porosity (too dense). Take care! "Handbook of thermal spray technology" says that it needs very long polishing time to reveal true porosity. For oxide ceramic coatings this is generally true. Epoxy resin impregnation of the coating prior to grinding/polishing will also help reveal true porosity. It is critical to get proper epoxy impregnation. I do a good vacuum impregnation then I made a pressure pot to that goes on my hot plate to make sure I get good impregnation. Remember you cannot let the samples cure under vacuum but, you can let it cure under pressure. If you are not sure if you are getting good impregnation you can put dye in your epoxy so, when you look @ the pores you can see if there is epoxy in them. ... I think about epoxy impregnation like this, if you don't put mortor in a brick wall it's easy to pull the bricks out. As for the porosity question. look @ the splat boundries and see if you are not burning the powder enough or if you are over burning the powder. The two biggest factors I find in porosity is amperage and standoff. I think epoxy resin cann't be used for TBC because it does not resist at high temperatures. I recommend you impregnation with anorganic sealants or laser superficial remelting. For low temperatures the epoxy resin is indicated. You are right about epoxy resin not being suitable for sealing high temperature thermal barrier coatings, but erick212 and myself are referring to impregnation of the metallographic test specimen only. I have a Porosity problem with Metco 71 FNS-2, Tungsten Carbide powder when it is sprayed on a 10mm diameter Titanium rod. Using the above parameters, when i spray on rotating titanium rod rotating at 270rpm, and traverse speed of 3mm/sec (using step program which is the same for flat test coupon), the porosity turn worse to more than 25% porosity. 1. Does anyone has some good parameters that you can share? 2. Does traverse speed of the gun and rotating speed of the part has any contribution to the unacceptable porosity? 3. Does the rod size of 10mm contribute to the porosity? 4. Is it common that as we increase the powder feedrate, the coating actually get denser for Metco 71 FNS-2?